Here’s one of those crazy Tiki bar drinks that we love to build because it uses just about everything behind the bar including the sink. 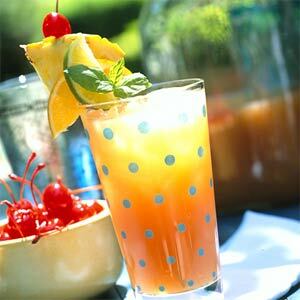 Rum, rum, and more rum, fruit juices, Falernum…mix it all together and you get one of those drinks that is fun to make, looks impressive to your pals, and tastes pretty damned good. Plus it reminds me of the Puca rabbit Harvey, and that makes me smile. Toss 1 1⁄2 cups of ice cubes into a blender and crush em up. Add all ingredients except the 151, blend on high speed. 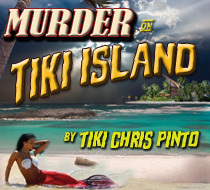 Pour into a Highball glass or tall Tiki mug. Then slowly pour the 151 rum over back of a (vintage) bar spoon into cocktail. Garnish with pineapple, orange, and a cherry on a little plastic sword. Cool drink! 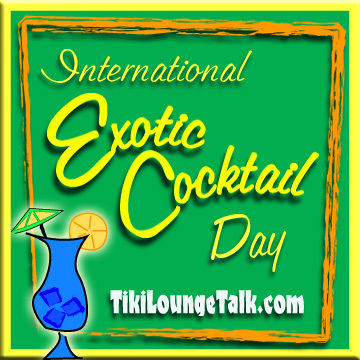 -Tiki Chris P. reporting from Pirate’s Cove Tiki Bar, on the outskirts of Fort Lauderdale, South Florida. Watch out for the alligators.